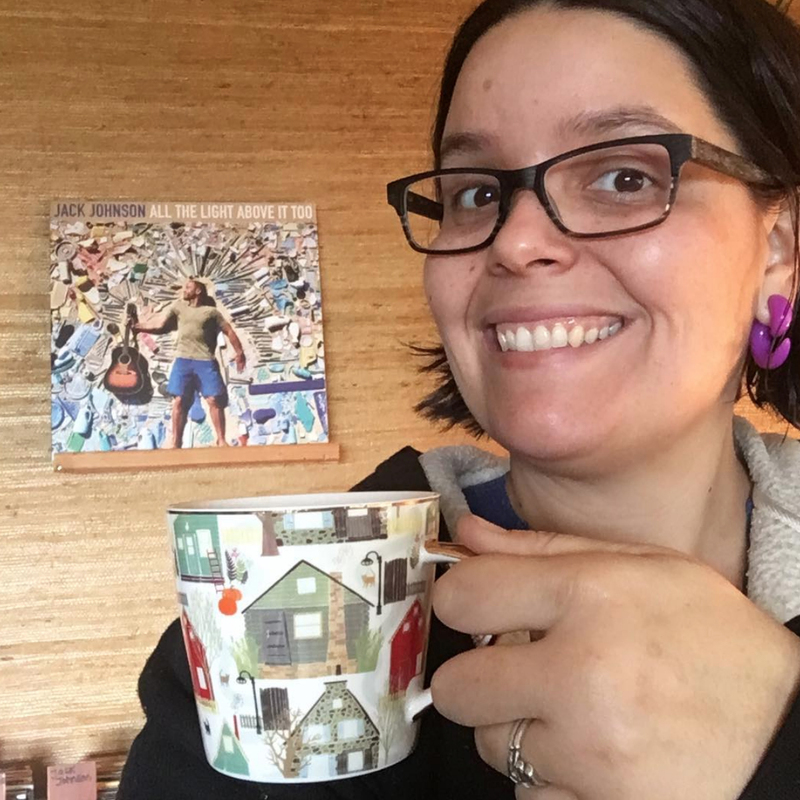 Since childhood I have hated making my bed, mainly because of the stupid flat sheet, I always thought it was so pointless… and then one day I discovered duvets and my life was changed for ever! 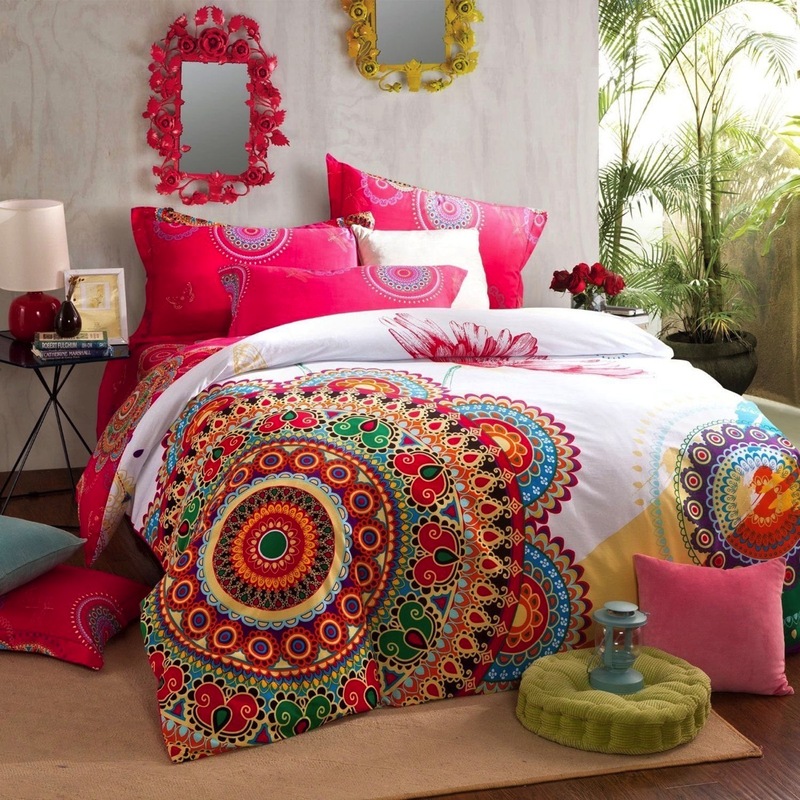 Duvets turn bed making time quick and easy, and best of all you can rotate your duvet as often as you like. 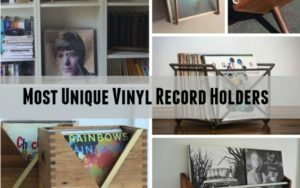 If you’ve been on the hunt for your next duvet with colorful boho flair, but can’t seem to find the perfect boho style duvet you’re in the right place, I’ve scoured the internet for the most colorful, unique, beautiful and fun boho style duvets, below is the top ten list along with direct links so you can purchase them for you home. 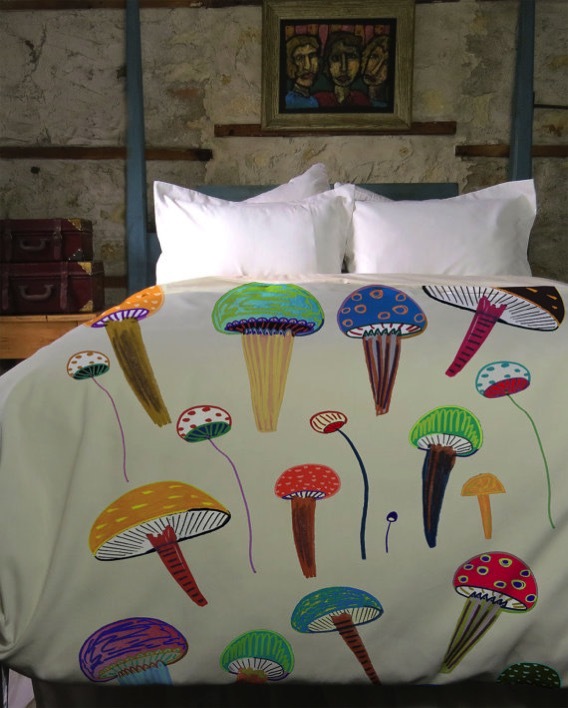 The very first duvet on our list is by artist Valentina Ramos. I have in my master bedroom and absolutely love it, it always puts a smile on my face when I walk into my room! 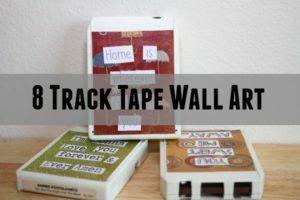 I love the bright and playful colors, it really reminds me of a doodle. 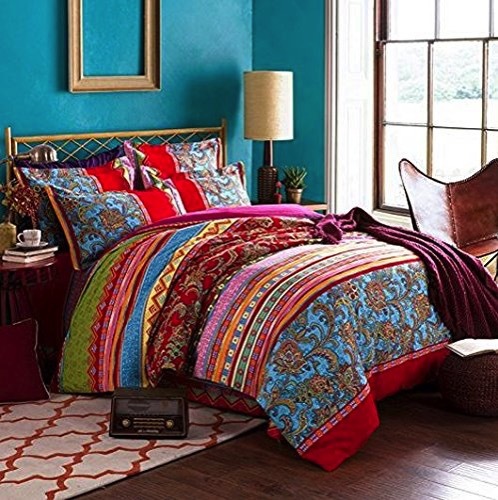 The horizontal lines and patterns of color really caught my eye on this boho style duvet, it would be a wonderful way to bring color into any room. 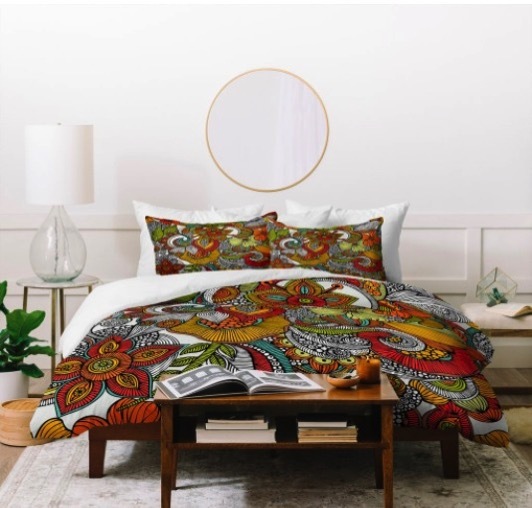 The intricate colorful pattern on this duvet really caught my eye, and I appreciate how they left majority of the duvet white to balance out the business on the mandala pattern. 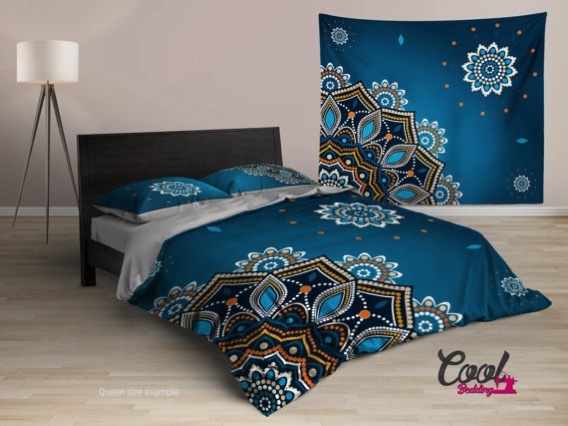 Lately it seems that dark aqua has been the color in style, what a dreamy color to have in your bedroom, it just feels so peaceful and zen, defiantly a duvet I could fall asleep under. Who doesn’t like colorful and fun mushrooms, this is so whimsical and playful, it really lets the inner kid out of any adult and would be a wonderful accent in a room needing a focal point. 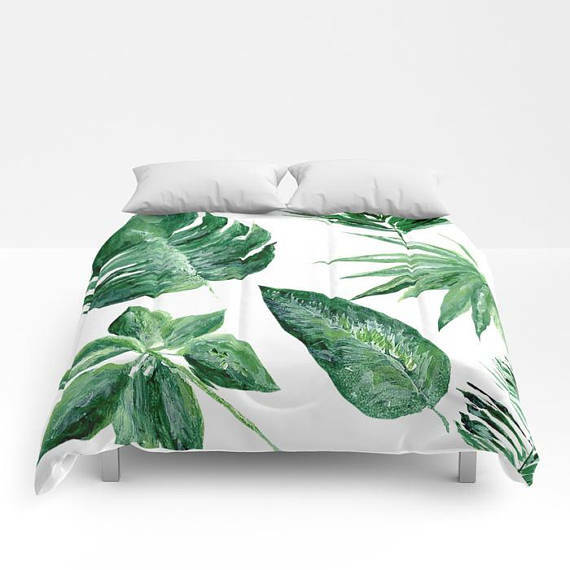 This boho style duvet is simply dreamy, who wouldn’t want to fall asleep in such a beautiful green jungle style vibe, this is a great addition for any nature lover or plant lovers room. 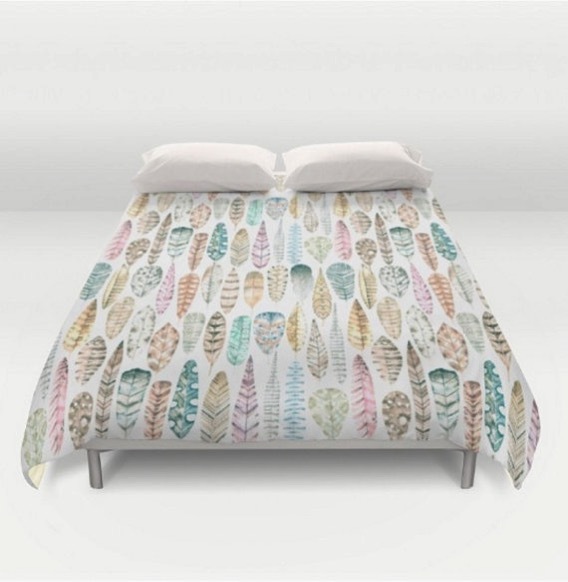 This subtle pattern of pastel bird feathers really mesmerized me, I love the fact that the feathers are pastel, it gives the duvet such a warm and earthy feel, but still has the beautiful hint of color for those who aren’t so much into the really bold colors. 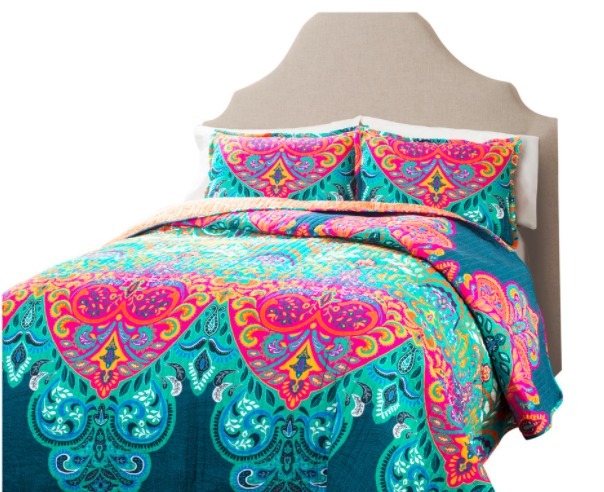 Vavoom, this beauty captures your attention in a heart beat, its such a fun and vibrant duvet, the hot pink and bright aqua color always pairs together so well! 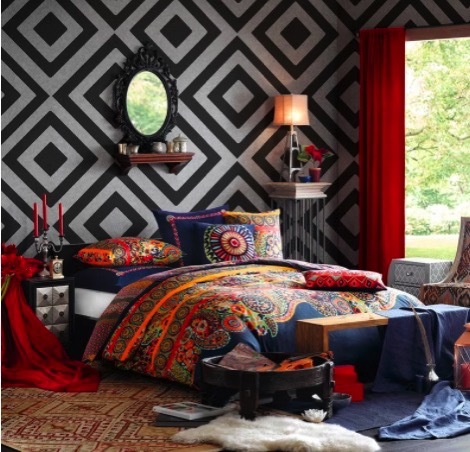 This duvet I really thought was unique, for the most part the boho style duvets tend to be very bright with light or white backdrops, this one went very bold by having the colorful pattern in the middle with a dark midnight blue behind the design, would be great for a bigger size room. 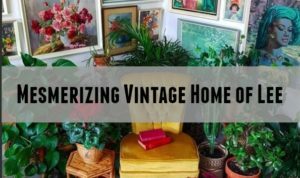 If you are looking for something with fun pops of color, that is not too overwhelming and loud, but a bit more traditional, this is perfect. 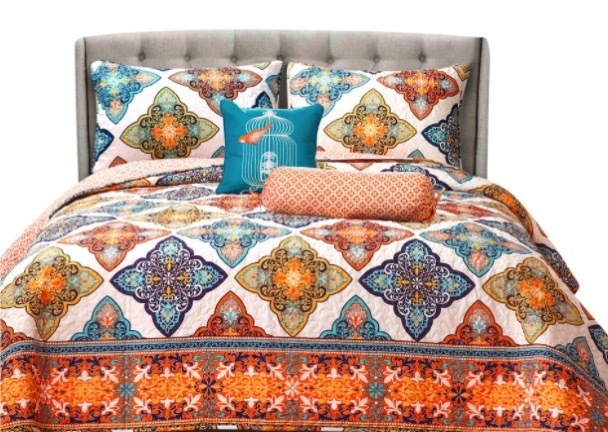 It has the boho touch, with some nice color, but is a bit more in the category of paisley design.